I have had five books published to date, four of them about individual artists. 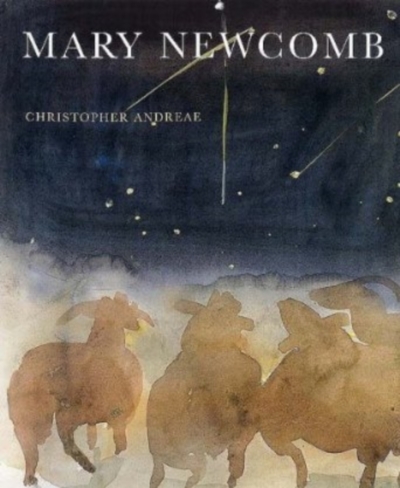 The first was Mary Newcomb. She worked in Norfolk/Suffolk countryside mainly, where she lived. Her drawings and paintings are like Japanese haiku, succinctly linking the very small and the very large, microcosm and macrocosm. Her titles are sometimes even closer to haiku, such as Very cold birds where one has flown away it knocked the raindrops off. Or (inscribed on a meticulous drawing of a plant known as "goat�s beard"): In the time it has taken me to draw this the shadows will have moved right round and the sun will have finished its course. Newcomb�s naturalist observation is spiced with a kind of wry humour about the behaviour of both people and animals. One of her projects, noted in her fascinating diary, was to depict "a lady dropping bread on a swan" � not throwing it to a swan. 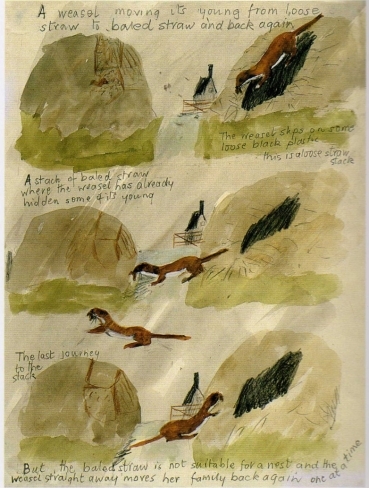 A watercolour, like a serious strip cartoon, shows A weasel moving its young from loose straw to baled straw and back again. Another shows Poppies angered by a passing cloud. Although this book is now out of print, it is still available from the Crane Kalman Gallery, London. This gallery represented Mary throughout her career, and continues to exhibit her work posthumously. You can also find the book on Bookfinder.com at various prices ranging from the fairly reasonable to the absurdly high. For my second book about an individual artist, my subject was Mary Fedden. In spite of also being a �Mary� she was (although a great admirer of Mary Newcomb) very different. She was first and foremost a painter of still life (though not exclusively). That was her real love. And she was as popular for this as she was prolific. After she had walked round a major retrospective of her work staged at the Portland Gallery, London, she said "I never wanted to be a soft "woman painter" � and I�m not, am I?" She painted with a bold clarity, with a sure touch. She had a collection of unusual objects, images of which she incorporated in her paintings. But most of the objects came out of her head � from her memory, and also from depictions by other artists. Although she enthusiastically and unashamedly allowed herself to be influenced by others, she turned these influences into her own distinctive style. She did not, like Cezanne, arrange her still lives on a table to be painted. The "arrangement" all took place on the canvas itself, and sometimes the juxtaposition of one object with another was rather surreal. 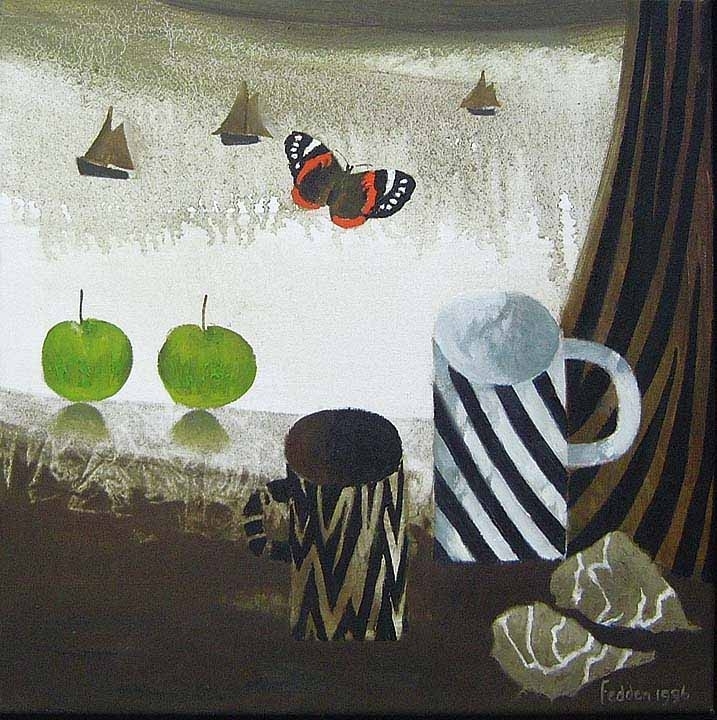 Sometimes objects are positioned or poised in unrealistic ways � apples, for example, may perch on the edge of a windowsill in ways that work perfectly in the composition of the painting, but in �real life� would have lost balance and toppled over. Paradoxically she was both a realistic painter, and an unrealistic one. She once told me: "If there is one thing I am very good at, it�s composition." I didn�t think she was being immodest; just straightforwardly factual. 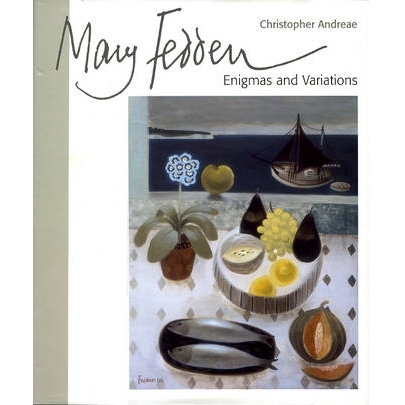 Mary Fedden, Enigmas and Variations is available from its publishers, Lund Humphries, on Bookfinder.com, or the bookshop of The Royal Academy of Arts, London. 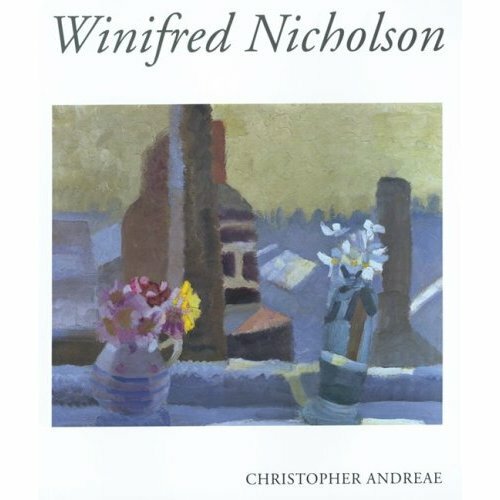 My third book was about Winifred Nicholson. Her interest in colour and light in landscape was predominant, but she painted some remarkable portraits. Having investigated abstraction in the 1930s, she went back after World War II to painting wildflowers on windowsills with distant landscapes beyond � the near and the far, the intimate and the universal. For her, flowers had the most living, magical colour of any natural phenomena, but rainbows and colours seen through prisms always interested her, and became something of a pre-occupation in her later years. I have long known and loved her work and it was a privilege to write a book about her. "Kings Road Chelsea" - Oil on canvas, 1925. (©) Trustees of Winifred Nicholson. This book is no longer available except second hand. Try Bookfinder.com. 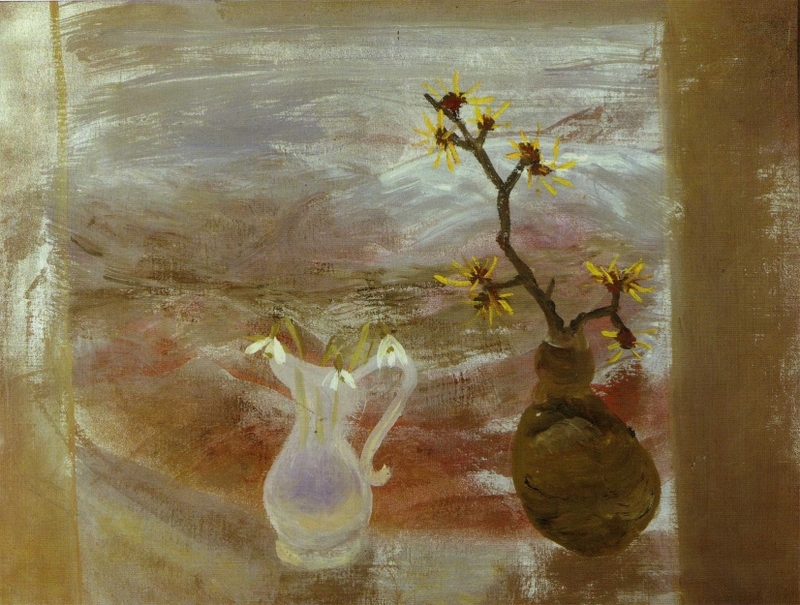 "Snowdrops and Bittersweet (Witch Hazel)" Oil and silver spray paint on canvas 1970. (©) Trustees of Winifred Nicholson. 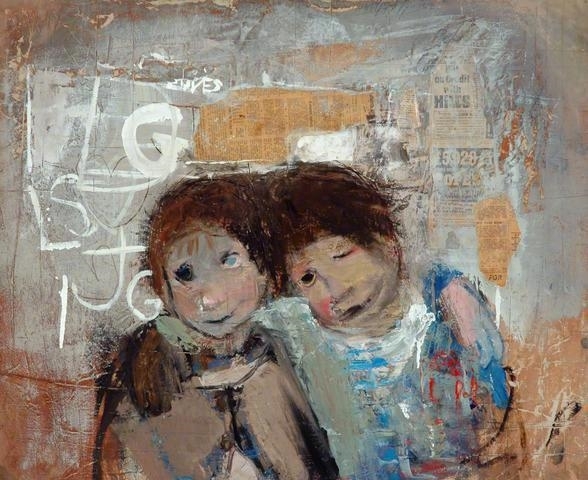 Joan Eardley (1921-63) is considered to be one of the most significant and original Scottish painters of the 20th century. Her paintings and drawings reflect urban and rural Scotland in an expressive visual language unlike any other artist�s. The aim of my book about her is to do renewed justice to the range, scale and power of her work. 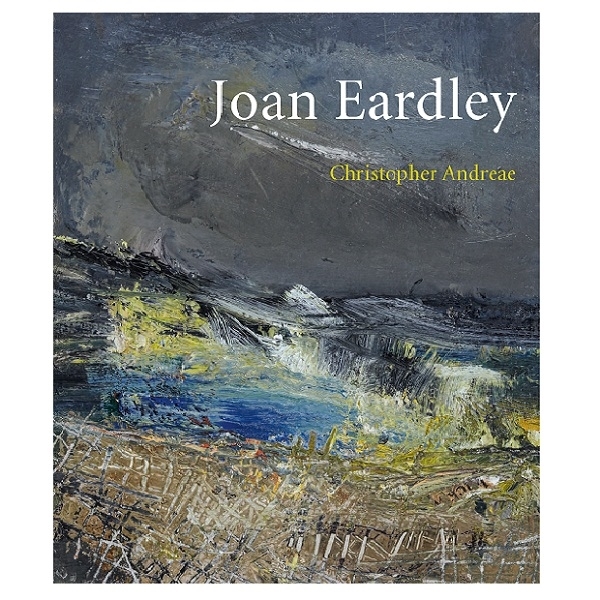 "Joan Eardley", by Christopher Andreae. (©) Used by kind permission of Eardley Editions. Her wild winter seascapes were painted out-of-doors on the shore or cliff top of Catterline, a small east coast fishing village south of Aberdeen. Eardley loved the light, weather and seasonal changes of this rugged coastline. Before she lived in Catterline, she had made her name with potently realistic but tender depictions of Glasgow slum children and the black tenements and grimy streets they inhabited. Her studio at Townhead was as close to this teeming city life as her cottage in Catterline was to sea and field. "Children and Chalked Wall No.4", by Joan Eardley. (©) Used by kind permission of Eardley Editions.